While reading blogs about blogging years ago, I came across a list of Blogging Dos-and-Don’ts that weighed in about gaps between posts. The list creator opined that lapses in posting shouldn’t be addressed but rather ignored as though the gap hadn’t occurred. This has been on my mind for quite a while. Can you tell I’ve decided to ignore this advice? [Back to John] From my perspective, as our first year on the road came to a close I found myself more interested in writing about my opinions than writing about our experiences. But my opinions were not the “mission” of this blog, so I was reluctant to keep posting them. More germane to the topic of this blog is, “Why did posting about the road begin to lose interest for me?” To some extent, the first half of 2013 was filled with learning-curve frustrations and mechanical problems that were, quite frankly, fun to write about and read. By the end of 2013, our learning-curve was stabilizing. We still had mechanical problems but they were less frequent and easier to overcome. So, fewer/easier problems = better quality of life, but fewer exciting things to post about. 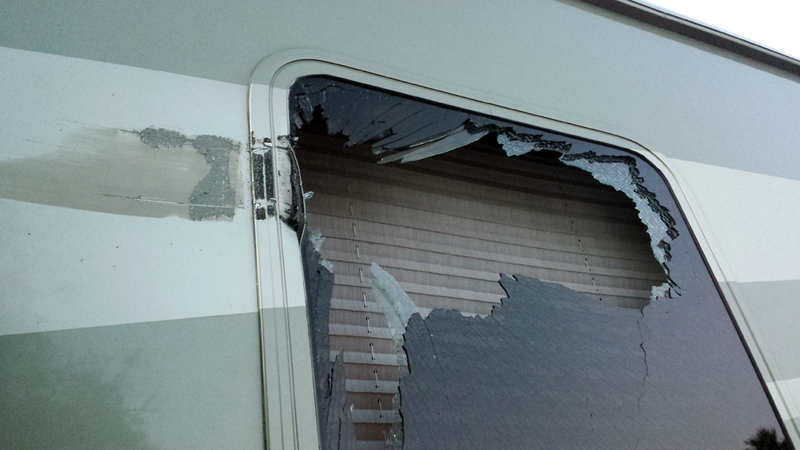 The only really memorable problem in 2014 was the time I destroyed a bathroom window in a February close encounter with a neighbor’s awning (fixed later by the Boys at Bend). In 2013, there was also the novelty of the fulltime RV experience, also fun to write about and read. But while the novelty wore off by 2014, the good times didn’t—in fact they got better. Some of our best times in the Edmund occurred in 2014. We were staying in a combination of places recommended by friends from the road and places we’d explored the previous year. We were staying longer in each place and really getting a chance to know an area. But it’s not as interesting to write about good times. The Lotus Eater effect sets in, especially under the sunsets of Arizona and the palapas of Las Vegas. As to why this post is titled “The End of an Era,” while we had good times and bad in 2014, the times were mostly good. 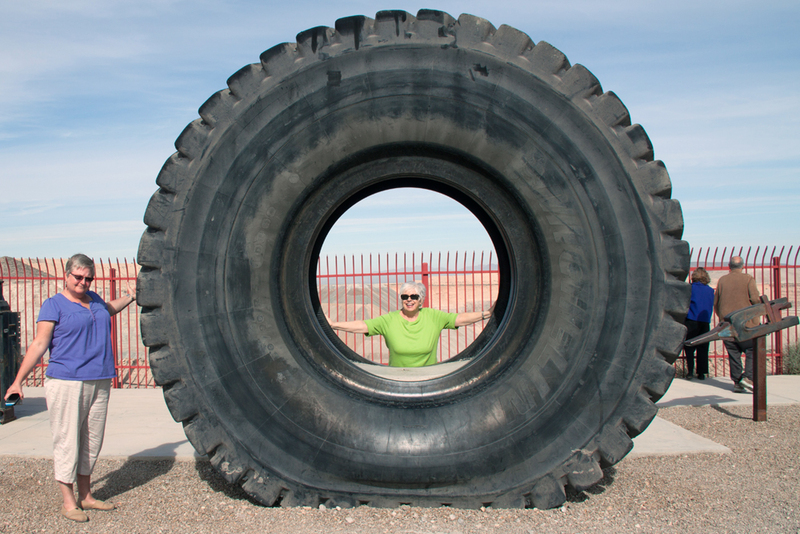 Health—my health—was a major catalyst in deciding to leave the road when we did. 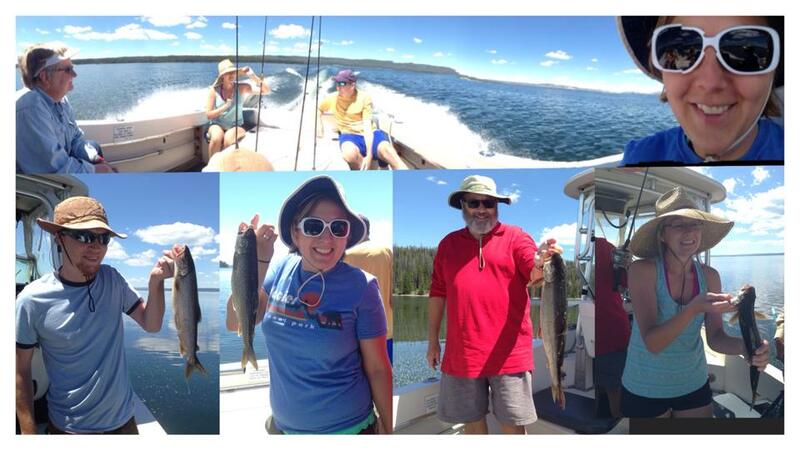 In Yellowstone, I was afflicted with crippling gout for several weeks. The gout resolved itself thanks to medication and I drove to Santa Fe—where my right elbow immediately locked up, most likely because of a repetitive motion injury caused by the laptop touchpad. It was beginning to look as though a random health incident could disrupt our plans in a major way if it hit while we were supposed to be going somewhere. We were thinking about settling down after a trip to San Diego and one more visit to Las Vegas in 2015. Pittsburgh was always our long-range objective. As we thought about Pittsburgh, we grew increasingly excited about living within walking distance of a library, a multitude of restaurants, and a daughter. So we decided, on VERY short notice, to leave the road and settle down right after we left Santa Fe. Now we’re in Pittsburgh and the Edmund is in storage waiting to be sold. But we had a good run. 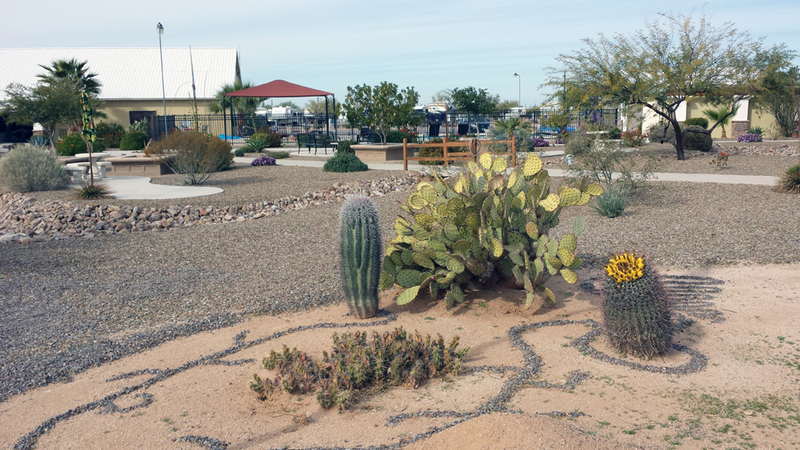 Looking back on 2014, these were the good times that stand out: We started January already in the Zen beauty of Desert Gardens RV Park in Arizona. We researched genealogy, got to know our neighbors Greg and Lynell, and reveled in our warmth while our loved ones were fighting snow in the Midwest and the East Coast. We were joined there by our friend Dianne from Atlanta and Barbara’s sister Mary Jo from Saint Louis. 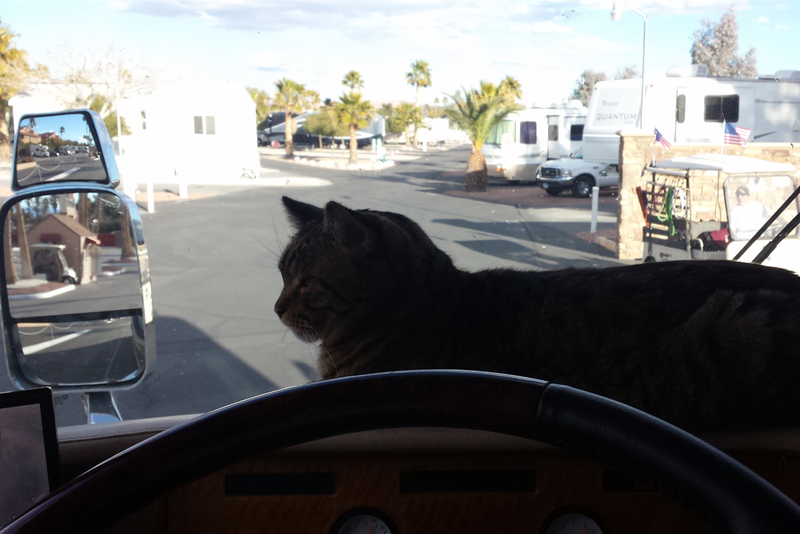 We visited with our Bend friends Bob and Ede Trockels at their place at the Sunscape RV Resort. We got to spend time in Phoenix with Vickie and Randy Roeber, friends from Algona Iowa, and with my piper droog (friend) Len Wood from the Atlanta Pipe Band days. 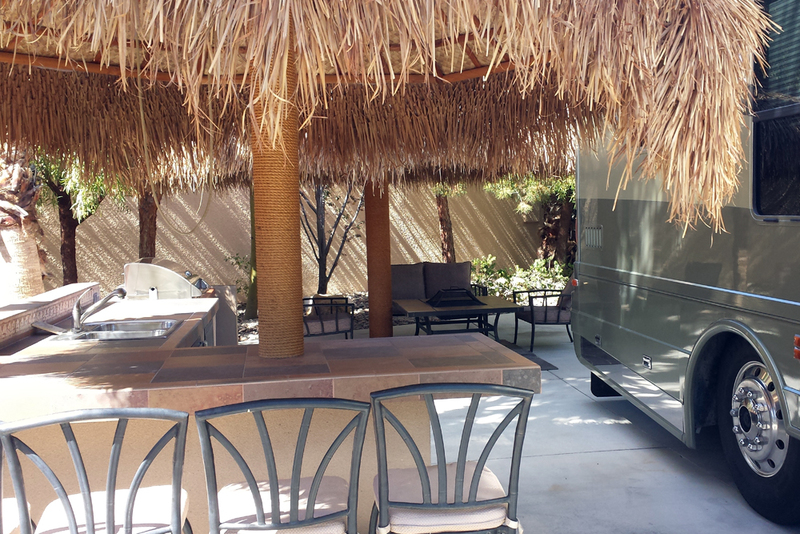 We spent three months in Las Vegas, two at LVM, a world-class Class A RV resort. At LVM we found a wonderful community of new friends, were introduced to water aerobics (thanks to Daren Johnson), and did Tai Chi. It seems all roads lead to Las Vegas. We met up with old friends from Atlanta, Bill Kirvin and his wife from the Georgia Rockwell/Boeing facility and Scott Hamlet and family. Scott is another veteran of the Atlanta Pipe Band. 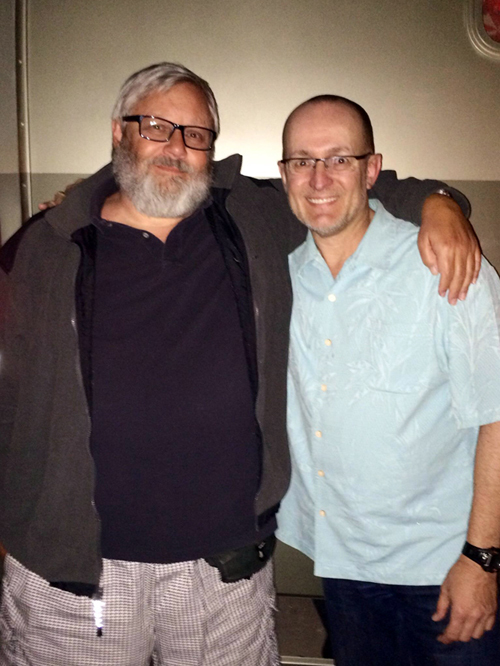 Together with Len Wood, the APB alumnus we spent time with in Arizona, Scott and I smelled the fear and rode the adrenalin rush in pipe band competition circles all over North America in the Nineties. 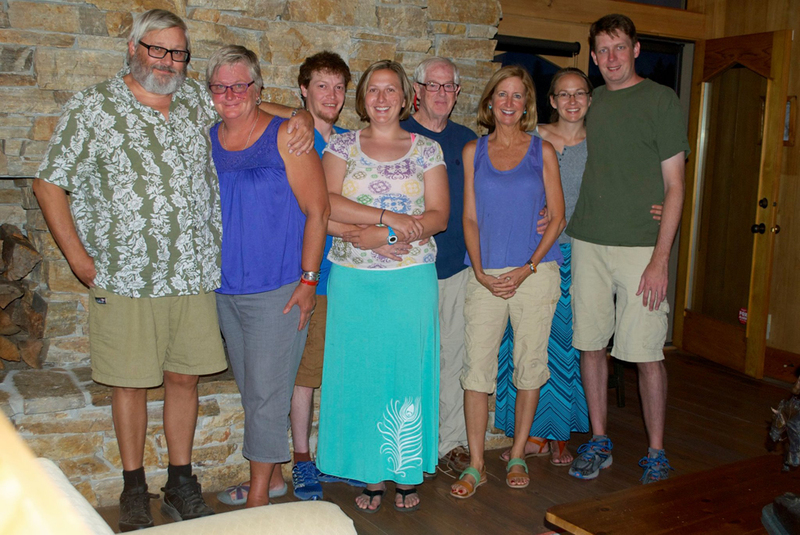 We were joined by Leah, Darren and Donna (Darren’s mom) from Pittsburgh, my brother Jim and his wife Ingrid from Chicago with three lads in tow (our nephews Kyle and Kevin and nephew-in-law Hansie), and my cousin Ann from Wisconsin. Under the palapas in Las Vegas at LVM, the most beautiful place we stayed during our two years on the road. 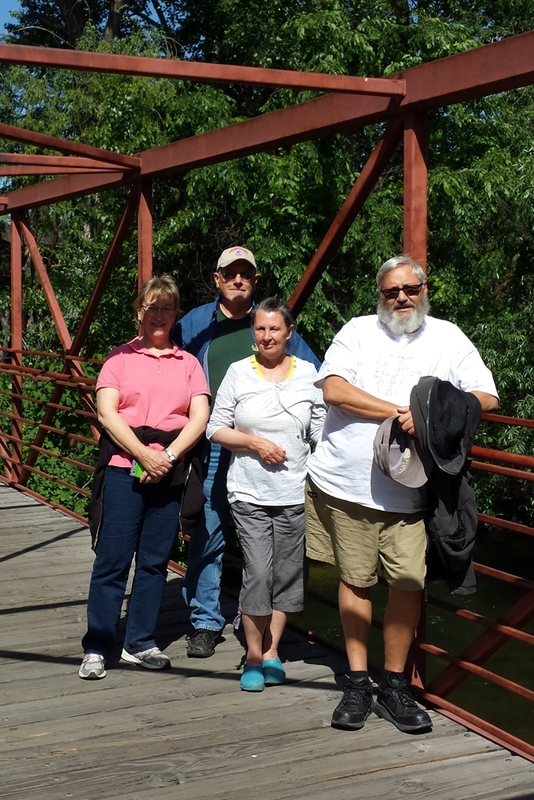 We passed though Boise Idaho and spent more quality time with my cousin Don, his wife Eileen, and Don’s sister—my cousin Sally—who was visiting from Wisconsin. We also got to see Don’s son Chris and daughter Carrie whom we haven’t seen since they were knee-high. They have their own families now. We spent two months wallowing in grand vistas and cavorting with majestic wildlife in Yellowstone while staying at RedRock RV Park. We were joined again by Mary Jo. Leah, Darren, Erin, and Benjy rented a nearby cabin for a visit. And there was another Algona contingent: my cousins Bob and Norma who were traveling with Mary, one of Norma’s many sisters, and her husband Norman. We met up with another former comrade from Rockwell in Georgia, Marian McClellan. She and her husband Patrick were renting a house in the area. 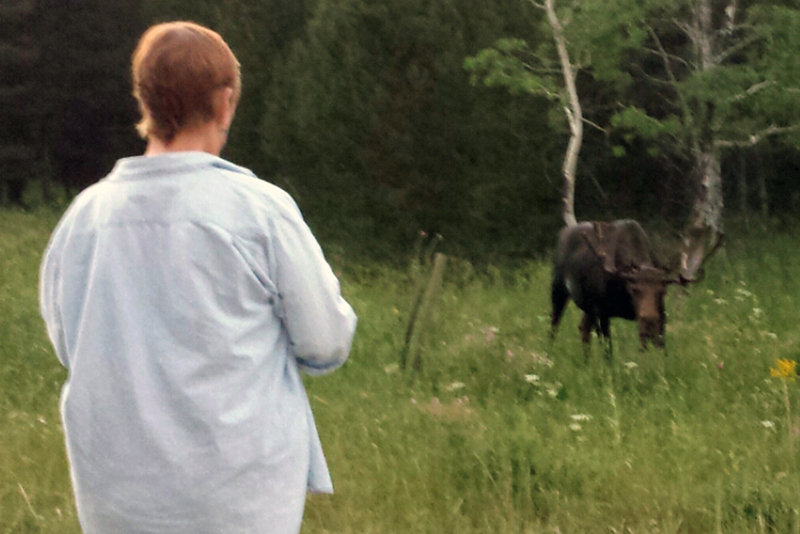 And we got to see moose! 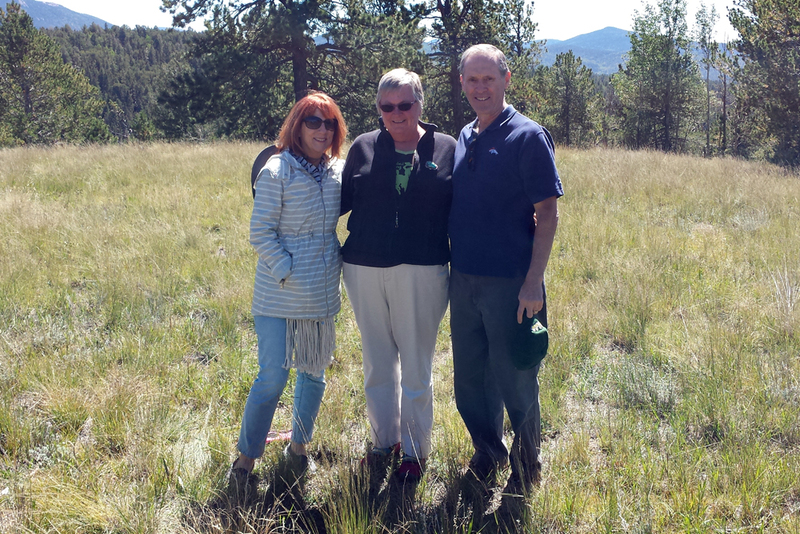 We spent two months in Santa Fe New Mexico with nephew Dylan, his wife Nica and her mom Cheryl and dad Cameron. Last year Wendell, Dylan’s scion, was still in utero. 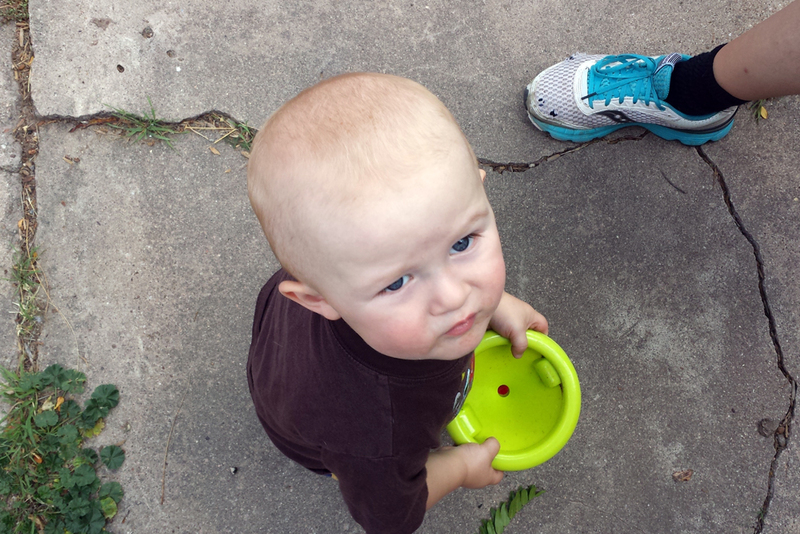 This was the first time we’d seen him on the loose. We ate copious amounts of good food, watched The Newsroom with Cheryl and Cameron, hung out at the Santa Fe Farmer’s Market, and saw several movies. The best film experience for me was seeing Forbidden Planet on the big screen in G. R. R. Martin’s little art theater. We had breakfast with our Colorado Springs friends Sarah and her husband Bob when they visited Santa Fe for an opera performance. We saw more of Sarah and Bob later in Colorado. No cowlings were blown off the Edmund over the course of this Santa Fe visit. We started working our way towards Pittsburgh via Colorado Springs Colorado where we stopped to see our friends Bob and Sarah again. Sarah is one of our oldest and dearest friends; we shared a house and cats together in Iowa during the Seventies. Bob is one of our newest and dearest friends, my “brother from another mother”. We sold Calamity Jane, our Honda Fit “Toad” to Sarah’s daughter Aubrey. We turned East—for the first time without a tow vehicle. 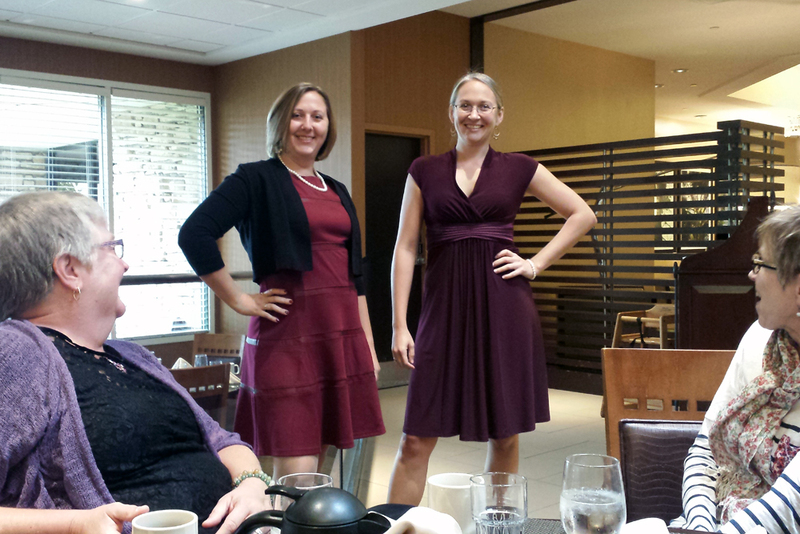 We stopped in Saint Louis for our niece Angela’s wedding and reunions with friends and family. And then we were in Pittsburgh. There were some bittersweet moments in 2014. In February I lost my cousin Tom. 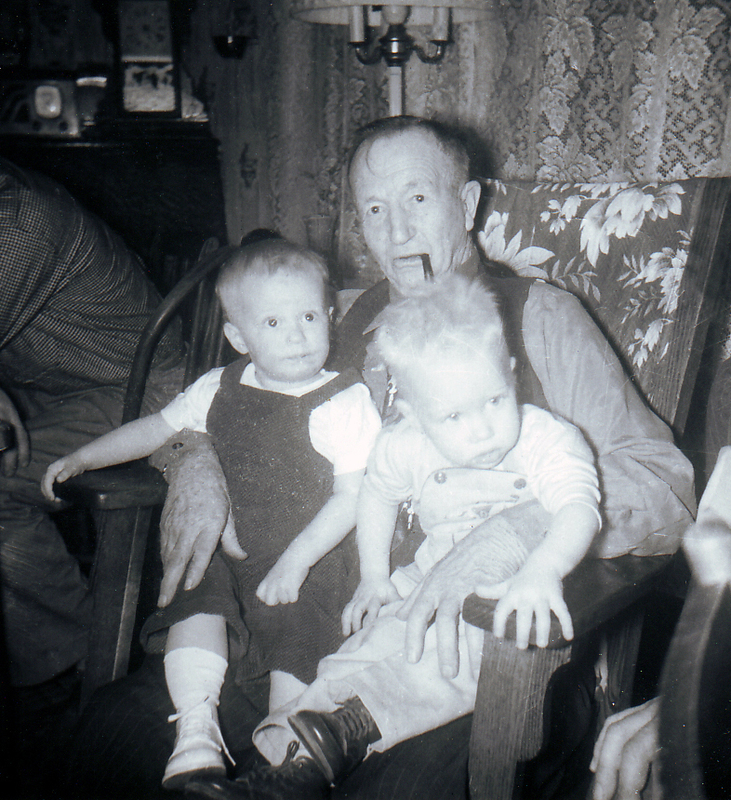 Tom and I were born about a month apart and were very close (along with his brother Tim, a year younger than us). We used to walk beans together on their parent’s farm. I won’t speak for Tom or Tim, but I think I chopped more beans than weeds. It was hard to say goodbye to Tom. I left Barbara, McGregor, and the Edmund in Arizona and flew to my brother’s in Chicago. 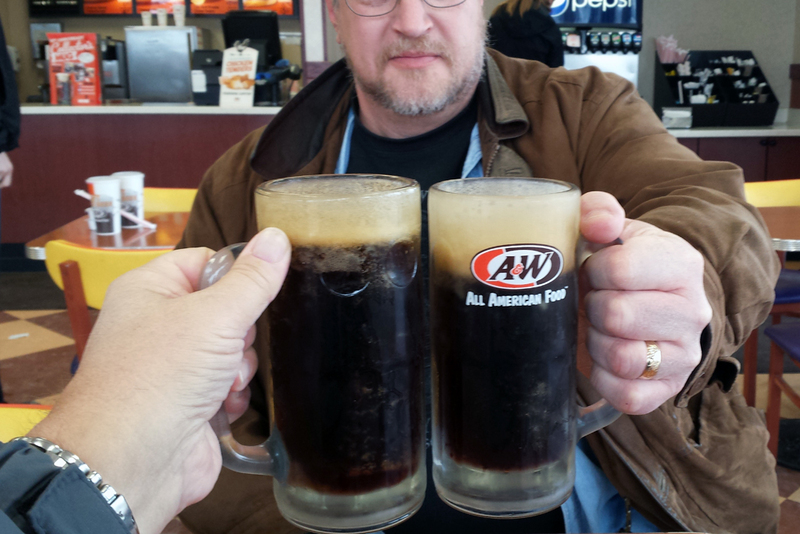 I got in some quality brother-time as we fought our way through the snow on the way to Algona for Tom’s funeral; it was some of the sweet that came with the bitter. More of the sweet. At the funeral I reconnected with Tom’s brother, Tim. Since we went our separate ways in the early Seventies it seems like we’ve only seen each other at funerals. 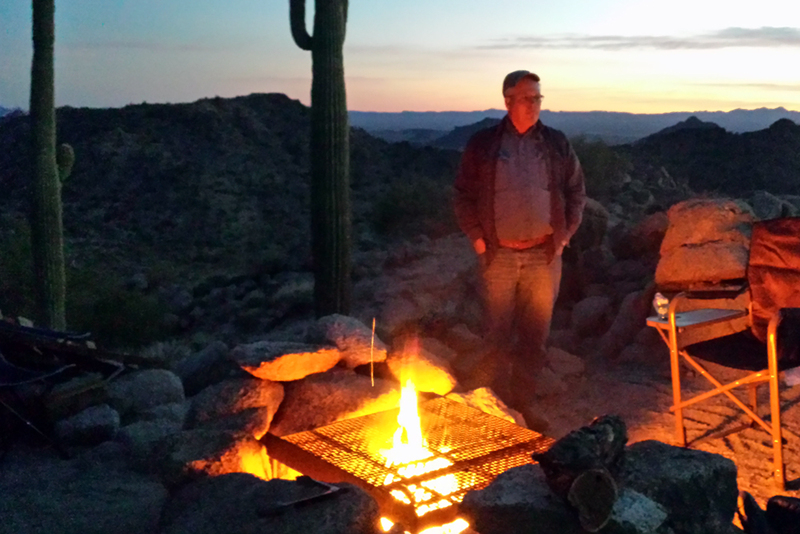 Tim and his wife Barb have a winter home in Salome Arizona and he invited me to stop by on the way to Las Vegas. 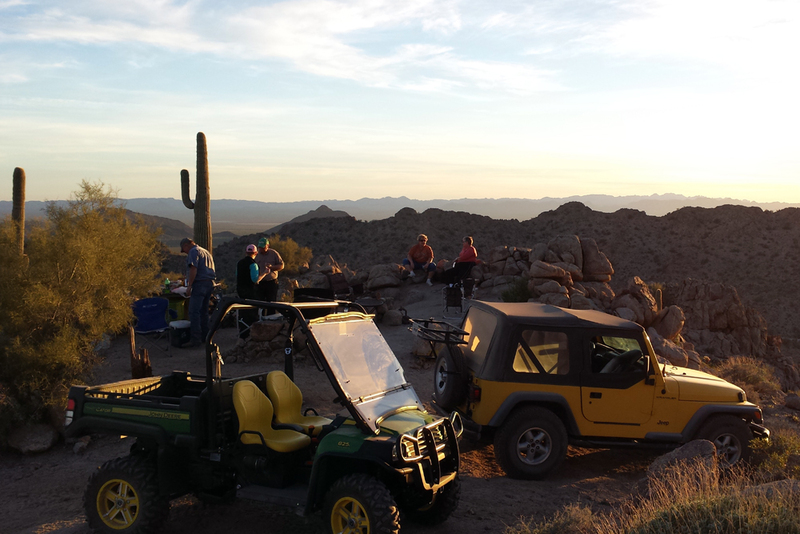 When we arrived they treated us to an off-road weenie roast on a mountaintop overlooking Salome. It was a spectacular picnic. Their house is on a taxiway and has a hanger attached. How cool is that? We lost our cat McGregor while we were at Yellowstone. His old injuries from long ago finally brought him down (we had to put him down). So, 41 posts covering all of 2013 and one LONG post covering January through October of 2014. How’s that for eschewing verbosity? I grew up in Norman Rockwell's America, let my freak flag fly, became a Nine-to-Five Well-Fed Television Watcher, and now I'm trying to figure out what I want to be when I grow up. Hello Friends! It is great to be a part of your journey online and never better in person. Hope our paths cross again soon.